The project, which launched in January 2018, was one of the few launched during the early part of this year but has bucked the soft real estate market with over 75 per cent of sales achieved, totalling in excess of Dh300 million ($81.6 million) to date. Today, the developer can confirm that the 27-storey building has topped out with the recent concrete pour of its roof, and is on track for delivery ahead of Expo 2020, in the summer of 2019. LIV Residence Dubai Marina brings a new take in luxury waterfront living with a focus on sustainability, well-being and happiness. The development caters to residents seeking to live the ultimate waterfront lifestyle with a choice of studios, 1, 2 and 3-bedroom apartments, with studios starting from Dh83,7000 ($22,780) and 1-bedroom from Dh1.29 million. The signature penthouses set a new standard in Marina living, with their Central Park style terraces and spacious open interior areas. Each has been lovingly crafted with contemporary yet timeless unique Italian finishes, including rich and honed Statuario marble and gloss lacquer state of the art kitchens. L-I-V has been committed to offering residents a sustainable, ethical building, and has partnered with a reputed international glass manufacturer to ensure the building is both modern and energy efficient. Products used in the building allow neutral transmitted light inside the building, with the result of lowering energy costs and reducing the need of artificial light and HVAC costs. 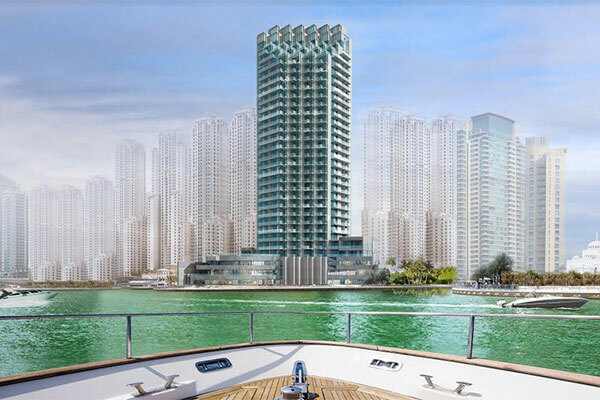 LIV Residence Dubai Marina has attracted a mix of buyers with most demand coming from European expats, specifically high-level executives and entrepreneurs who appreciate the European flair represented in LIV’s design aesthetic. Buyers have also been attracted by convenient financing, with a payment plan of30 per cent during construction and 70 per cent on completion, together with the speed of delivery, set for 2019, unlike most off-plan properties on the market which require buyers to wait three to four years for a move-in date. Latif Habib, CEO of L-I-V Developers said: “It has been almost 10 months since we successfully launched LIV Residence Dubai Marina. We have maintained sales momentum over the first two phases of the project and feel we have delivered on our promises made to purchasers. The project was based on a strong location and a well-judged pricing that we knew would remain attractive in a softening market.